FinproTrading has been acquired by Coinexx.com. FinproTrading is a forex broker. Finpro Trading offers the MT4 and Trade Station forex trading top platforms. FinproTrading.com offers over 80 forex currency pairs, commodities, cfds, stocks, indicies and EFTs for your personal investment and trading options. Was quiet anxious about this whole merger thing as i had been with finpro almost 3 years now. Initially was unable to login to my MT4 accounts & after i spoke to them i was asked to change server name or rescan servers. Once i did that i was able to login to my accounts. My funds were in my account and my trades were running as i had left them with finpro so that was quiet reassuring. Regarding crypto only deposits n withdrawals issue most of us are faced with – I’m okay with it because i believe if we choose to trade with offshore brokers this is an eventuality that we all have to face and embrace sooner than later. Just getting use to not being with finpro & coinexx looks good so far. Whether the new broker lives up to the standards that Finpro created - only time will tell. A bittersweet moment for me to let go of my favourite broker. PS: The fiat deposits i had with Finpro have returned to my bank account. But it took more time as opposed to the 1 or 2 working days it took when business was usual. I reckon, it is not because they plan to disappeared with our money but only because this whole migration thing is slowing the operations. Hope this helps those who are as panicky as I was when I received the email. Beware of this broker. Finpro merged with Coinexx with any prior warning to clients. That being said, I made a deposit on the 21st of December and it is the 1st of January and my account hasn't been credited. Raise this issue with several customer care personnel but nobody seemed to genuinely care about my case. Seriously thinking of leaving this broker as the trust I had for them is lost. I've never experienced so many issues with a broker. Right now the entire website is down for 'maintiance' which is supposed to say 'maintenance' but whatever. Someone there cant spell and no one cares to correct it. Website has been down since Christmas eve. It says mt4 should work fin but that's not true. Logging into mt4 gives an error that says 'invalid server name'. So it basically looks like they've disappeared completely along with everyone's money. If the site does come back up, I'm closing my account and taking my money elsewhere. I should have stuck with my guns the first time I said I didn't want to deal with them. Now it might be too late. They have my money. And I cant get it. Website is down, can't login to my mt4 so not only can I not trade but they i'm assuming my account balance is gone too. 1. You might wish to read and really understand what your customer is saying. Yes, I have been very critical of your platform and lack of support. I was told on day one that what you provided was stable and compatible with Apple computers. MT4 is not stable even when using Vine software. 2. I have not yet asked for a withdraw and as of today I am being told that everything will be paid out in BTC which I didn't use to make original deposit. I spoke with a customer service rep and she verified that all withdrawals will be paid in BTC regardless. I wired in USD and expect USD back not BTC. 3. All any trader wants is a broker they can trust. Trust as in stability of platform, support, and that the traders money is safe and will be given back when requested in the currency they deposited in. If I want to take possession of BTC I will do so on my own and not because my broker wants to change the rules when they like. 4. I think you can read through many, if not all reviews on your company, and you will see you fail on 85% of them. The other %15 either gave up or don't care. 5. Regarding your management, I have read through my reviews and not once mention them. I have done so in personal email with my original contact and I have referred to Finprotrading as a bucket shop. 6. I am guilty of warning others to use caution when considering to do business with you. It is your customers who are writing these reviews and they are doing so based on one thing, EXPERIENCE WITH YOUR FIRM, NOTHING ELSE..! 7. Rather than wake up and respond to the reviews that customers are writing, it might be better to either find solutions to the problems or shut down your company. 8. I personally just want trade with a HONEST broker, which I don't think you actually are. As FloridaTrader said, once you find or feel your broker is not honest, hiding something, or changing the rules of how you will pay out it all equals FRAUD at worse or pure LYING at best. 9. It doesn't take a rocket scientist to see that at the outset my reviews of your company were favorable but after 15 months and having brought up issues in a polite manner which are never addressed you have seen my reviews go from 4 stars down to 0 stars. I am on record letting anyone who comes here to AVOID you as a broker. I would even advise them to not do business with anyone that is not regulated. Without regulation, we the trader have no recourse but to notify the UK regulators, the FBI (if in the US) which I have done, and hire attorney which I have also done. 10. Traders want to win more than they lose but at the end of the day they want honesty on the other end and I can say that after my experience with Finpro you are not. 11. If your management CEO wishes to contact me they may do so anytime. I won't hold my breath as you can read the top 10 reasons why he nor any other manager will. Email doesn't count. 12. Good luck and with the help of others and the FPA , we the traders, will get the word out to others about Finpro and hopefully they won't make the same mistake we have. This poster is ABSOLUTELY CORRECT!!! Scam and fraud so you have been warned. Sep 20, 2018 - 1 Star I have been trading FX since 1985 and am going to give you my honest review after using this company now for little over a year. I had to look for another broker after the leader FXCM shut down in the US. 1. In-house platform grades at F. Needs to be completely torn down and rebuilt or ONLY promote Meta Trader. 2. Order handling grades at F. Slippage is a big issue as are requotes. I honestly don't think that there is anything behind the bid/offer quotes. 3. Customer Service A. The only problem is you can chat, which doesn't always get the point across, rather than call. 6. Speed of execution A. No complaints but never had any with FXCM either. At the end of the day I would not recommend Finpro and I will be closing my account. As another poster mentioned, I was told at the time of opening my account that they would soon be accepting Debit cards and ACH but today nothing. I will be closing my account and moving to Interactive Brokers and if I have any issues with getting my funds I will let you, the FSA and my attorney know. Good luck and hopes this helps! Apr 19, 2018 - 1 Star I am only rating order execution as I have already rated the very poor in house platform. Poor order execution with slippage as much as .5 pips. Example, you have limit order to sell EURUSD at 1.2350 and order is filled at 1.23495. The same occurs on market orders IF you don't get requotes. Maybe should change the name to Requote Trading. Sep 8, 2017 - 1 Star Please allow me to change my review from below, love the spreads and execution but their platform is DOGS***!!! Absolutely blows! Sep 1, 2017 - 2 Stars I happened upon this broker thru this web site and love the execution and spreads but THE BIG PROBLEM is their platform fails on many levels, hence the two stars. I won't go into all the problems as I am sure they are aware of what they are and where the improvements are needed. If you have an alternative charting package and just looking for execution then this place is great. Reply by FinPro Trading submitted Oct 18, 2017 Hi mwash! We are glad you like our trading conditions but are sorry to hear you have issues with Trade Station. Finpro offers standard platforms, MT4 and Trade station , to clients for trading used by 95% traders from around the world. However, if Trade station is not the platform that fits your trading and charting requirements, we’ll suggest that you try MT4. Please get in touch with our support agents on Live Chat, should you require more information. You have been very dissatisfied with "Trade Station" past one year though most of our clients using the platform have no complains. We've requested you in the past to move to Meta Trader 4, if Trade Station does not meet your trading requirements. But you have chosen to trade on the platform all this while. We consider your editing the same review repeatedly, citing the same issues past one year, an intentional attempt to bump the review back to top in order to defame the broker. Regarding the withdrawals, you have been with us for almost an year now and had withdrawals been an issue, we are sure you would have listed that as an concern somewhere in your review(s). Therefore making a statement on the public forum expressing doubts about our withdrawal process seems simply a deliberate effort to mar our reputation. Kindly reconsider moving to MT4, if Trade Station does not meet your requirements. And we assure you that if you request for a withdrawal, it will be processed within the stipulated timeframe. Reply by FinPro Trading submitted Dec 6, 2018 Hi Micheal/Mwash! We appreciate your concern over rhukevhe's plight! But if you consider us scam and fraud, then why have you chosen to trade with us till date? Its ironic that you choose to defame us on public forums by repeatedly leaving negative reviews over the course of last one year but at the same time choose to trade with us. And its only on 19th November, 2018 you requested for a withdrawal in an email that threatens to defame us on all public forums IF OUR BANK or ANY INTERMEDIARY BANK charges you a fee for withdrawal. We are posting this piece of information here because we anticipate the next review update can be on this. 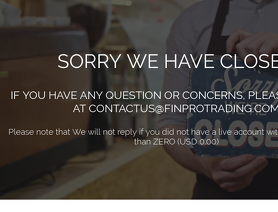 So we are clarifying it publicly in advance that "FinProTrading" does not charge any withdrawal fees but if a intermediary chooses to do that we cannot control that. And we also request you to get back to our team and share your bank details, since they have been following up with you on the details but you have not responded back as of date. Lastly, we request you to refrain from using derogatory language against our management team in the emails you send us. --> This is an outright lie. We told you that the principal amount will go back the same way and any profits via an alternate mode, which at this time is BTC. Please refrain from twisting information and posting it publicly. --> Please refer to replies to point 1 & 2. --> This is not for you to decide, please let the traders decide on it and make their own judgement. --> And we also asked to refrain using derogatory language about them in your EMAILs. Please refer to the last rebuttal again. --> We wish you luck in finding a broker that fits your requirement. We don’t force clients to stay with us. They can choose to move on. --> We are not threatened by this. If you think that it is worth your time and effort for $150 of deposit that you have with us, then you have the right to make your decisions. PS: the team is still waiting for your bank wire details to process the withdrawal. Finpro Representative, Sneha Garg, sent me the following email in response to my request to close my FinPro accounts. (Fortunately, I have no significant funds at risk). I had cited the FPA complaint filed by another trader and my loss of trust in Finpro as an associate of TurnkeyFX. Sneha made some good points in Finpro's defense, so I wanted to share the Finpro response with our FPA membership and viewers. Finpro’s response is posted below and is a true and accurate copy of the original email with the exception of my personal information deleted. 1. Finpro claims the aforementioned trader's complaint was with Turnkey Forex, a separate and completely different broker. Yet, the evidence submitted by the Complainant are account statements from TurnkeyFX(UK) Ltd, the same as statements for Finpro Trading. 2. Finpro claims TurnkeyFX(UK) Ltd. is simply a technology provider. This claim raises the question, why are traders' funds sent for Finpro accounts directed to TurnkeyFX(UK) Ltd.? Clearly TurnkeyFX(UK) Ltd. provides the technology and controls traders' money. 3. I raised the issue with Finpro regarding their only available means to transfer funds was by bank wire. Finpro responded citing issues with their bank. In my experience with Finpro, I have never sent money to a Finpro account. It has always been sent to TurnkeyFX(UK) Ltd. If Finpro is simply a "white label" or front for TurnkeyFX, it would make sense why the money goes to TurnkeyFX. 4. The aforementioned Complainant provided evidence implicating TurnkeyFX(UK) Ltd aka Turnkey Forex in an alleged scheme to steal hundreds of thousands of dollars in trading profits from the Complainant. Regardless, if Finpro claims Turnkey Forex is a separate entity, the Complainant's evidence shows TurnkeyFX(UK) Ltd. may be complicit and in my experience, my money for my Finpro accounts has always been sent to TurnkeyFX(UK) Ltd.
5. I have been a victim of broker fraud. Once trust is lost, it can never be recovered. Please be advised that TurnkeyFX (UK) Ltd is not a forex broker, its only a technology provider, as it takes care of our technology hence our servers are in the name of TurnkeyFX. The broker you are taling about is TurnkeyForex which is complete different entity and in no way related to us. Bank wire fees - In case of bank wire fee refund, the step was taken due to the increased transaction cost by our bank on the incoming wires hence we are in conversation with our bank and restructuring our deposit options so as to avoid the huge transaction cost. Cash deposits - We do not take any kind of cash deposits, in fact if you talk about any other broker as well, cash deposits are not accepted in order to avoid any kind of fraudulent activities and meeting all the compliance policies and norms at the same time. Regulations- Being unregulated doesn’t hint at unscrupulous activity by a broker. It’s important for traders to understand that the global Foreign Exchange market is a decentralized market. This means that online brokers do not need a license, they can simply operate with an offshore company incorporation and business bank account. We treat client funds with utmost priority therefore they are kept in segregated banks accounts and Finpro have no access to those funds. Moreover, we choose to be unregulated so we can provide the best in class trading conditions to all the clients from across the world without any kind of restrictions on leverage or other trading conditions. FPA (TurnkeyFX) – The review you are talking about is for TurnkeyForex which is complete different entity and in no way related to us. i hope i am able to solve your queries to the best, feel free to get in touch with me in case of any questions, i will be happy to assist you. Dec 2, 2018 - 1 Star This is a revision to my review dated July 1, 2018. In another FPA thread, "Scammed by Turnkey Forex", a Complainant, known as "rhukevhe" reported TurnkeyFX(UK) Ltd has refused to allow him to withdraw hundreds of thousands of dollars in profit from his account until he complies with requests to provide three years of tax returns, letter from his employer, bank statements etc. TurnkeyFX has sent the trader his initial deposit. The funds being held are the trader's profit. The Complainant's post are a bit sketchy and not articulated well, however he does provide some evidence in the original thread. In my opinion, the Complainant's thread is sufficient to raise significant issues. FinPro Trading is a front or affiliate of TurnkeyFX(UK) Ltd. My evidence is copied from an email I received from a FinPro representative regarding bank wire instructions. The following is an accurate and true copy of that email. This is in regard to an enquiry you made on support@finprotrading.com for bank wire details. I have been a FinPro client for over a year. Finpro has always provided the MT4 platform through TurnkeyFX(UK) Ltd servers. Based on this evidence, it can be surmised that FinPro is TurnkeyFX(UK) Ltd. On a personal note, this revelation causes me great concern. After three years in Forex and now on the brink of success after dealing with other criminal brokers, FinPro appeared to be a prayer answered. Great service, spreads, execution, low commissions with one incident of suspected stop loss hunting. Most importantly FinPro accepted US traders. So, it brings me no joy to post these comments. "Scammed by Turnkey Forex" thread, since it is highly relevant to FinPro. FinPro has garnered good reviews and it can be assumed many traders open accounts with FinPro based on FPA reviews, particularly US traders. I look forward to FinPro's response. Jul 1, 2018 - 4 Stars As an active full time US trader with three years FX experience, I have very limited access to the small minority of honest brokers in the world. I have been with FinPro for over a year now. I have compared their spreads to the most competitive brokers out there, including prime brokers and FinPro is always competitive. Rollover (swap) fees are a little less competitive. They have an extremely low commission structure for ECN accounts. There was a pretty rough period while they were revamping their site and business model, but it seems to have smoothed out now. I had a couple of stop loss executions that were suspicious, but I can't say with certainty they were cases of stop loss hunting. I think the best policy is to use virtual stop losses or not at all or rely on other types of exit triggers. Although, Finpro offers different trading platforms, they have not added MT5 yet. When there are system wide problems, which is rare, FinPro has not been particularly forthcoming about the problems, but they have improved their online customer service chat and communication may have improved. FinPro uses Turnkey FX as a third party provider for MT4 ops. Regarding the possibility the third party is actually a market maker or camouflage for a market maker seems to be negated due to the absence of nefarious pricing and low trading costs. I have yet to withdraw funds, so I will withhold the fifth review star until I get a few problem free withdrawals completed. In summary, particularly for US traders, FinPro is one of the very few good viable brokers I have found on this planet....so far. A technology service provider does not usually handle a broker's banking. The FPA believes the claim that FinProTrading is totally unrelated to TurnkeyFx is in conflict with their use of TurnkeyFx's bank accounts. This is a scam broker which also owns Turnkey Forex (turnkeyforex.com). Link to complaint filed against turnkey forex. Its seems you are posting your review at a wrong listing. We are NOT related to TurnkeyForex.com . Please share your review on their listing if you have an issue with them. Venting out your frustration on an unrelated broker listing will not help solving your problem. Please approach your broker. I'm using FinPro based on BabyPips ranking for US traders going offshore and my experience so far has been excellent. Instead of 50:1 leverage here in the US I now have 200:1 plus initial deposit matching and $2usd/Std Lot commission. They have a server in the US and my fills are excellent. Their Customer Service is outstanding. I've been trading Forex for over 20-years starting with TradeStation until they exited this market and FinPro is the best Broker I've used since then. My only wish is for them to use PayPal for deposits and withdrawals.